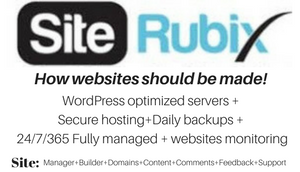 Is Site Rubix the best Website Builder for a Small Business? Is Site Rubix the best website builder for a small business and can it compete with the other popular like-minded applications currently out there on the Internet Market today? First and foremost Site Rubix was developed as a front-end application as part of the Wealthy Affiliate training platform for building and hosting websites. 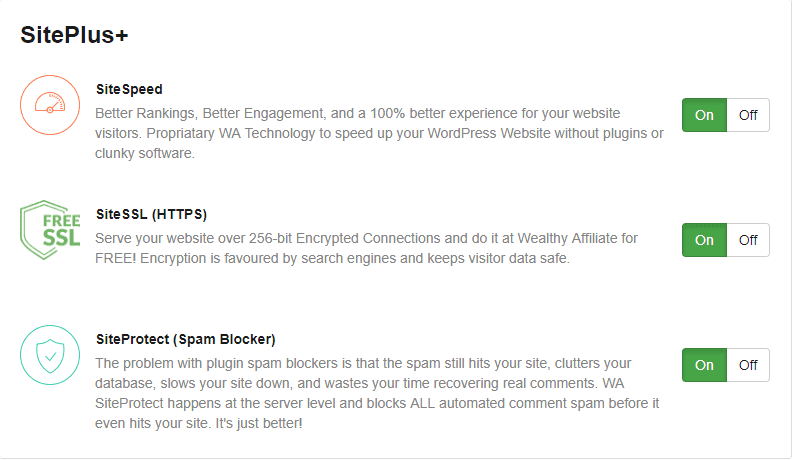 The back-end application is, of course, WordPress, the largest self-hosting blogging tool used on millions of sites and the number one choice for many. There are 2 membership versions, free and paid, I would always advise that you try the FREE membership first but we will get to that later on. There are many website builders currently out there on the market today, which I have tried such as Wix, SiteBuilder, and 1&1 and there are many more, and they are all good in their own right with what they give you, but what they don’t give you is an Independent Training Platform where you wouldn’t need to go anywhere external for any of your affiliate marketing requirements, except for your research. In this review I am going to go into details about what Site Rubix is, explain what all the features are and give you an open-minded insight as to whether this could be right for you. What Exactly Is Site Rubix? SiteRubix was launched in 2007 and was originally a drag and drop editor, but is continuously being developed, and today is a world forerunner in website builders. 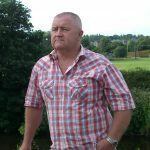 As I am writing this review a new development has just been added to Site Rubix, which gives you access to over 1,000,000 FREE images to add to your content and website. Just think about it, you don’t have to worry about copywriting infringements anymore, but not only that, there are no additional fees, not like many of the sites out there charging x amount on a monthly basis. Some are quite expensive too! Every little saving helps don’t you think? Site Rubix was designed with the newbie in mind which allows you to get your business up and running quicker and more efficiently, and allows you to focus on the business end of building your website(s). Creating a website with Site Rubix is easy and takes only a couple of minutes. In fact, I have seen this done within the training literally in less than 1 minute. What sets Site Rubix apart from the rest of the website builders is that it comes with a dedicated training platform with support and all the tools you would ever need in order to become successful online. It will take your website development completely to a new level, and once you have mastered the 4 essential steps there will be no stopping you. It can be anything you want. A hobby, a passion, an interest. This would all be explained in a very simplistic way, and it may be that all you want to do is create a website as a hobby, whilst most would use this step to find a Profitable Niche where they could make a substantial income from. If you would like to know more about what a Niche is and how it fits into an online business, then you could read an article I wrote below. This should clear up a few things with your perception of what a Niche actually is. This is the next step, to build your website and this is where it all happens. The foundation of your business and where everything happens and of course the fun stuff, because nowadays that is exactly what it is. Don’t let this intimidate you. Building a website isn’t scary, it’s fun. You can literally build a professional looking website in minutes with the tools available. In fact, you can watch Kyle, who is one of the co-founders create a website in less than 1 minute here. 3. 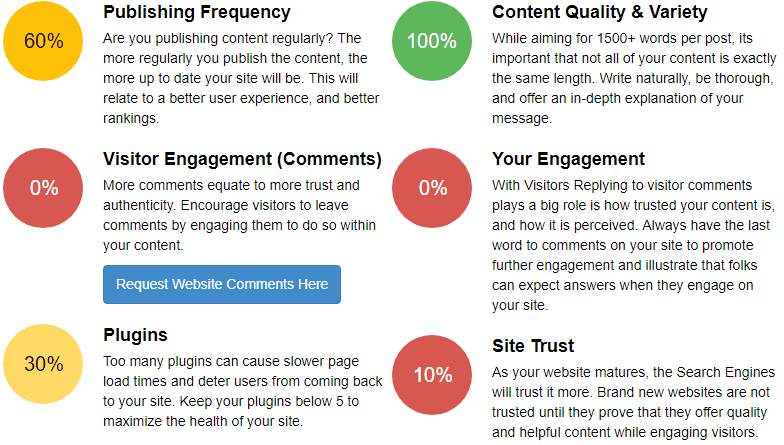 Get Ranking and Visitors. How to get traffic to your website. You will be taught how to get your website in front of thousands of people searching for things relating to your niche. Keyword research and how to find that great keyword to build your content around. Learn how to master SEO (search engine optimization) and save literally thousands on PPC (Pay Per Click) advertising. When you have mastered the 3 subjects above then its time to reap the rewards and earn commissions, from the products that you sell. 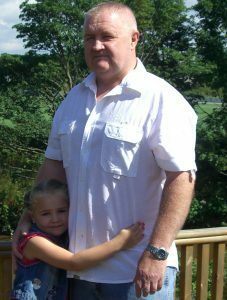 How a few years has made such a difference! I’m happy to say that those days are well and truly a thing of the past! All the technical aspects that you needed have been completely removed and Site Rubix provides you with an experience that allows you to be up and running within minutes, which means that all the technical stuff you had to spend hours on tweaking here and there can now be spent in other areas, maximizing your time in building your business. 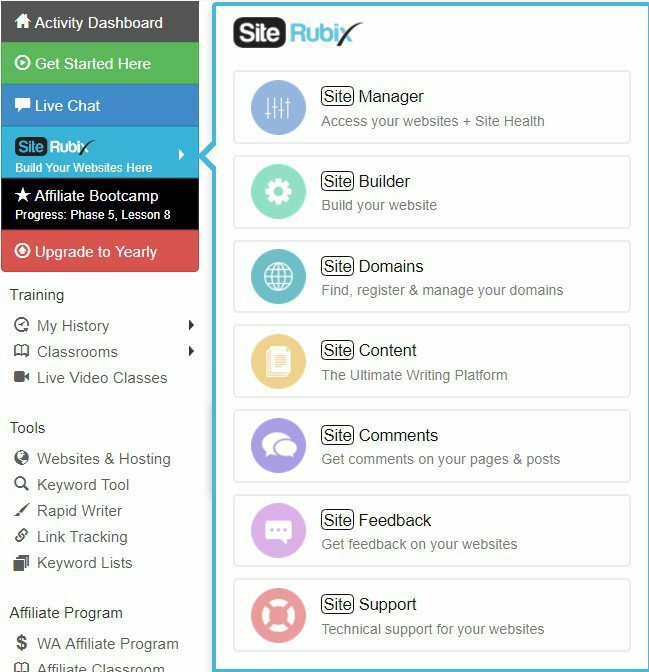 Site Rubix is powered by Wealthy Affiliate which provides you with all the training, support and tools to turn your idea into something that you can be proud of. If you are serious about creating an online presence it is essential to have a website to promote your business and to get your brand out there to the billions who are searching for anything and everything. If you think about it, as of 2017 there is literally around 3.8 billion that has access to the Internet, which roughly speaking equates to around half the world population. Just think if you could get access to a fraction of that figure, the possibilities are endless don’t you think? With the combination of Site Rubix and Wealthy Affiliate and of course Word Press and the dedication to succeed you are in a unique position. Everything in one central location. Something you don’t get with other Website Builders. The thought process in the development of Site Rubix makes it simple for anyone to succeed no matter how much experience you have online. When I was researching online for ways to earn an income, I tried several programs but couldn’t resonate with any of them for all sorts of reasons, but mainly I couldn’t see how I was ever going to be successful doing what others were teaching. It just didn’t make any sense to me and all I would have ended up doing was spending more and more money. I suppose we all have some sort of additional sense, pretty much like when you are purchasing your next home. You get a feeling and it’s sometimes a gut feeling that you go with. When I joined through Site Rubix it was painless and very straightforward. There were no up sells whatsoever, not like many products out there and I wasn’t asked for my CARD details either. These are the 2 major things I look for when I am thinking of purchasing a product, and if there is so much a sniff then I leave well alone. Within maybe a minute I had the training application at my disposal, with direct messages from the co-owners Kyle and Carson which is certainly a plus in my mind! Not that it matters but I come from a software development background and therefore have seen many software systems throughout my career. Some good, some bad, and I can honestly say that within 1-2 hours I had decided that I had stumbled onto something that I felt comfortable with and had been developed with the newbie in mind. At a glance, you have everything at your finger-tips and is so easy to navigate around, and to be quite honest a long time since I have seen such a professionally designed product. What about the Community and Support? The community is made up of many individuals from all walks of life with all levels of knowledge and experience who are there to support you on your journey in this incredible business along with coaching, training, and help in all matters relating to your business development. If you have ever tried building a website in the past, you will know how you are always going to run into problems across a multitude of areas no matter how much experience you have, and to achieve your goals you will need constant support and coaching and there are buckets of it here. You will find like I did that the support is second to none and no matter what question needs answers to, be rest assured that you will get that answer along with many other different ones too. Giving you alternative answers which gives you additional ideas going forward. I have never seen such a turn around when it comes to answering questions and the beauty of asking your questions is that it gets a discussion going amongst the more experienced entrepreneurs. Take for instance…I might already have the answers to what I am trying to achieve, but sometimes I create and submit a question to the community only to find out how others are doing things. There is always more than one way to achieve your goal and someone else may well be doing it better. Use your network of members and make them work for you. If you need clarification on anything then the co-founders Kyle and Carson are more than happy to help. Starting an online business can be very overwhelming for many, especially individuals who have never been involved with anything like affiliate marketing before, and it helps to have people who are friendly and who are prepared to help you every step of the way. As you can see in the image below there are 7 tools which are part of the Site Rubix application. Let’s take a look at them further shall we? Shows at a glance all the main functionality of your websites(s). Pretty much self-explanatory, but we shall take a look at a few that are worth looking at, for more details. The bar along the bottom of the Site Manager allows you access to some other activities. Another great feature just added for October 2017. You can see at a glance whether your posts require optimizing for speed to ensure your reader has a pleasant experience. There is nothing worse than doing research and coming across a site that takes ages to load. Or whether you wish to create and register a new domain. A facility which allows you to search for domains, transfer domains from other hosting platforms to Site Domains at Wealthy Affiliate. 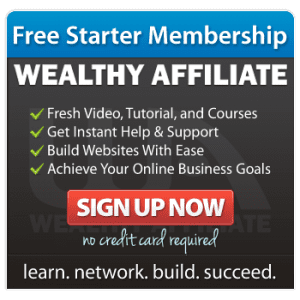 It’s easy, it’s quick, and it allows you to use all of the domain features offered at Wealthy Affiliate. 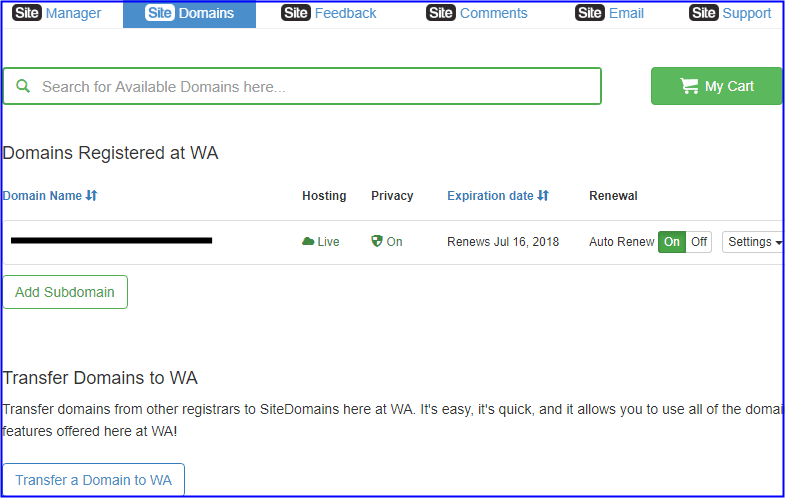 You can also point domains that are registered outside of Wealthy Affiliate to WA Servers and host your websites. Add sub-domains and transfer domains that are external to Wealthy Affiliate. Manage all your domains in one central location. Wealthy Affiliate allows you to have everything in one location and you’ll find it hard to beat on price too. 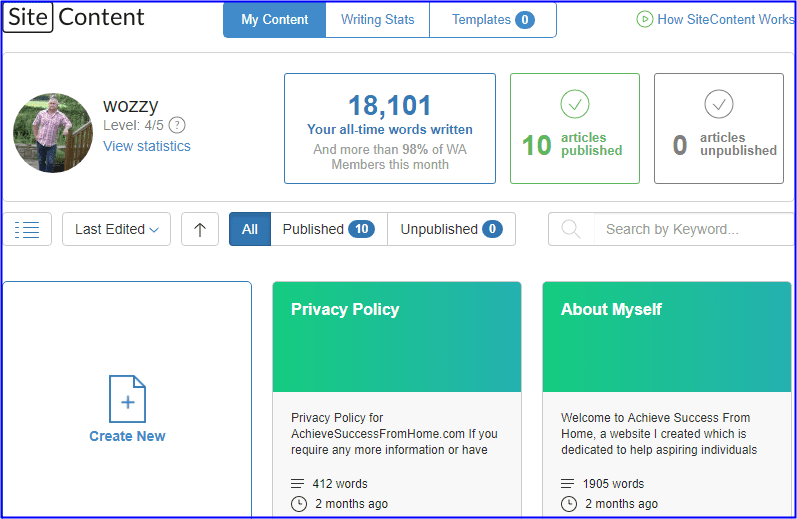 This is the ultimate writing platform for content marketers, authors, and webmasters. Full of features that will help to simplify your writing experience, with available stats that will improve accuracy and increase efficiency. A writing experience all in one central location. A great feature just added for October 2017 is access to over 1 million free images. Just think about it, no copywriter infringements and no monthly fees. If you are like me then you will know just how costly it can be on a monthly basis for using what we are told are Royalty Free Images, and in many cases, this just isn’t true at all. Every little saving helps, but in this case quite a considerable saving. Is a powerful platform that allows engagement in the form of comments on your website which is a key component to ranking in Google as well as other search engines. This is the only platform available where you can get real comments, from real people who are interested in your type of website. Is a way which you can forward constructive criticism and also allow other authors to return the favor. A great way to improve your business. 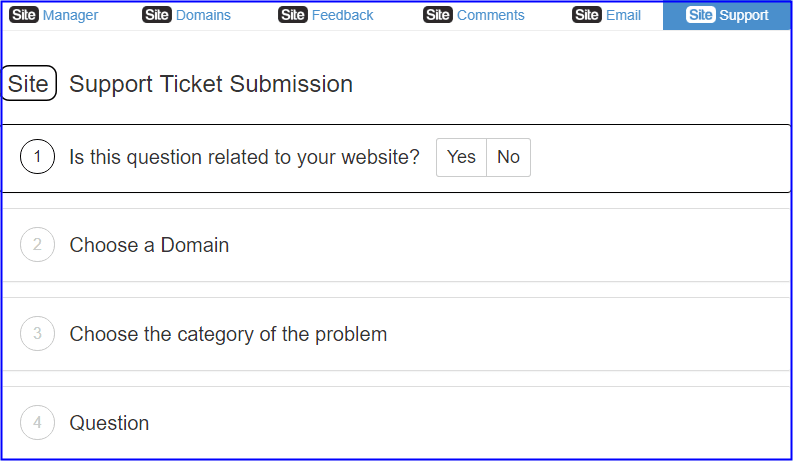 A facility which enables you to create support tickets for technical issues relating to your business amongst other things. It is always nice to have dedicated support which covers the technical aspects and the turn around is very good. No waiting 24 or 48 hours. Support is about as good as it gets. Require more time to make a decision? When preparing a review it is often difficult to cover all the areas involved in the product, but I do try to include what I think are the main areas and benefits that you need to know, and hopefully, that is what I have done and given you just enough information to try it out for yourself. I would like to point out that it took me several years of wasting my time listening to people and their products and getting absolutely nowhere until I came across Site Rubix and Wealthy Affiliate. I only wish I had found this platform much, much sooner. It could also be that you are at the very start of your research in finding ways to make money online, and if it is then all I can do is wish you the best of luck in your journey, but if it is then you could save yourself a lot of wasted time and money by just taking this for a FREE trial run. Well, a few days of assessing just what the product offers and nothing else, because as I said you can join as a FREE member and there will be NO UPSELLS and you will not be asked for your CARD details. My guarantee to you is that I will have your back on the inside, and will help you as much as I can. If you are serious about learning how to build a successful online business there is no better place and this will be the best decision that you make and one you will not regret. I don’t know whether I have convinced you that Site Rubix is the real deal or not, but I can only give you my own true honest opinion and the rest I have to leave up to you to decide. What I will tell you though is that I haven’t looked back since becoming a member and see myself here for the foreseeable future. I truly believe there isn’t a product on the market that comes close! 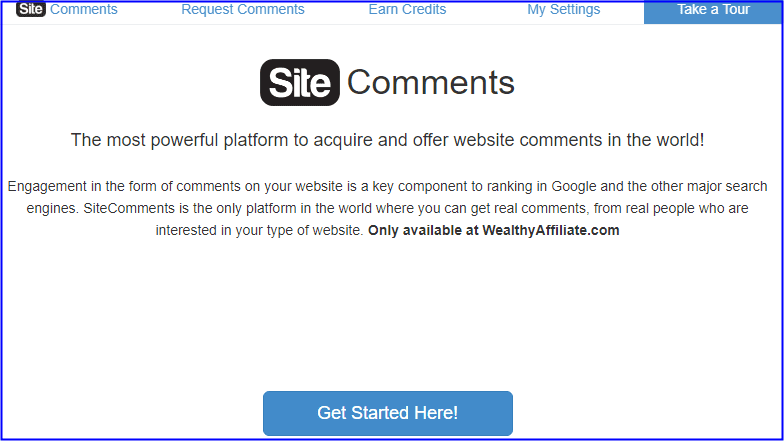 If you would like to read an in-depth review of Wealthy Affiliate then you can check it out by clicking the link below. Hopefully, I have answered many of the questions that you were asking yourself about the product, but if there are some questions that still need answering then please feel free to leave a comment below, both negative and positive as I would love to read them both. I will get back to you at my earliest convenience and answer them to the best of my knowledge. I would like to thank you for taking your time out and reading my review and hopefully, you have found it of interest, and I would like to wish you all the best in your research and moving forward with whatever you do in life. Previous Previous post: What is a Niche Market in Online Business? Next Next post: What is a Niche Marketing Strategy and do I need one?